*Indicates the center, institute, or initiative is aligned with multiple divisions (Arts and Humanities, Natural Sciences, Social Sciences, or Engineering). "Born and raised in the Midwest, Im a small-town girl with big-city dreams. I was born in Nebraska, but I was raised in the small town of Avoca, Iowa, graduating with fewer than 50 students in my class. 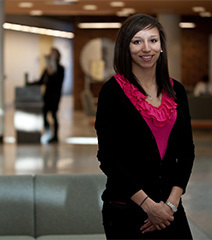 I am a pre-medical student planning to graduate with majors in biology and psychology, as well as a minor in chemistry."